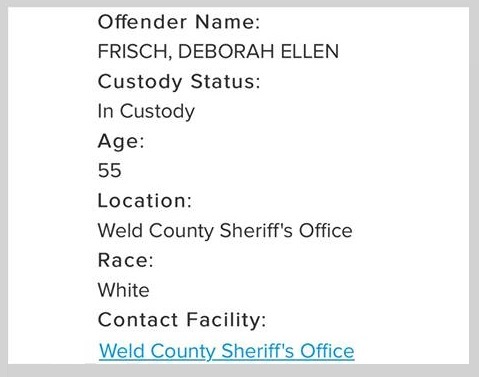 Frisch is expected to stand trial soon on Felony Stalking and Threatening Charges--unless she has the good sense to plead guilty and beg for mercy... Weld County electronic files also record Miss Debbie as accused of additional(?) charges of Intimidation and Contempt of Court. Details of these additional(?) crimes are, as yet, unavailable. As of Monday morning, Debbie remained behind bars at Weld County Jail in Colorado. Weld County issued a felony stalking/threatening warrant on Debbie on November 4. Soon after, Miss Debbie was arrested in Yreka California on 10 November, on charges of drunken disorderly conduct. She was extradited to the Colorado facility several days ago. 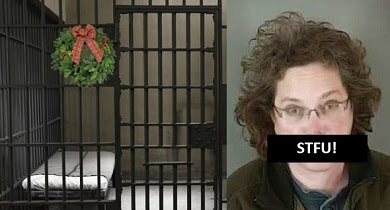 Miss Debbie almost spent Christmas 2015 in an Oregon jail, but was sprung two weeks before the holiday. Soon after, she fled Oregon to be near her enabling parents . Weld County CO (Dec 9)--After a brief appearance in a Weld County Criminal Court on Thursday, Criminal stalker Deborah Ellen Frisch was assigned the date of Dec 16th for her next "Disposition Hearing"
As of Friday morning, Debbie remained behind bars at Weld County Jail in Colorado. Weld County issued a felony stalking/threatening warrant on Debbie on November 4. Soon after, Miss Debbie was arrested in Yreka California on 10 November, on charges of drunken disorderly conduct. She was extradited to the Colorado facility several days ago. Weld County CO (Dec 6)--Deborah Ellen Frisch will be appearing in a Weld County Criminal Court on Wednesday, court records revealed today. The hearing is listed as an "Appearing on Arrest Warrant," referring to Frisch's facing Felony Stalking and Threatening Charges, as a result of her latest criminal menacing of a long-time victim and his family. Daddy Enabler to the Rescue? There's some speculation that, once again, Miss Debbie's enabling parents might attempt to interfere with holding Debbie responsible for her criminal actions. Allen D. Frisch, who was questioned by San Diego law enforcement last month as to his criminal daughter's whereabouts, has a long history of financially enabling Debbie Frisch's 10-year history of stalking, libeling, threatening and menacing innocent citizens. 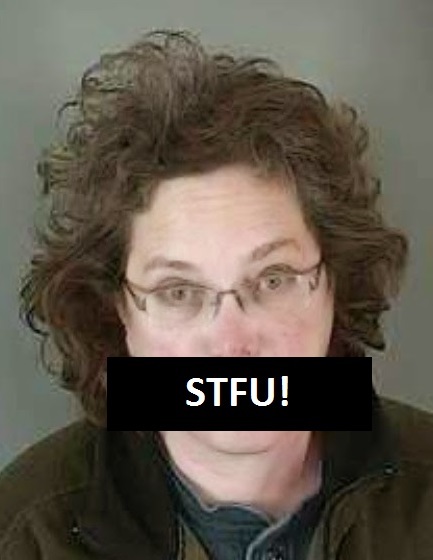 DEBBIE FRISCH NOW IN COLORADO CUSTODY! Weld County Colorado issued a felony stalking/threatening warrant on Debbie on November 4. Soon after, Miss Debbie was arrested in Yreka California on 10 November, on charges of drunken disorderly conduct.